FOR BETTER, FOR WORSE. When Fi Lawson arrives home to find strangers moving into her house, she is plunged into terror and confusion. She and her husband Bram have owned their home on Trinity Avenue for years and have no intention of selling. How can this other family possibly think the house is theirs? And why has Bram disappeared when she needs him most? 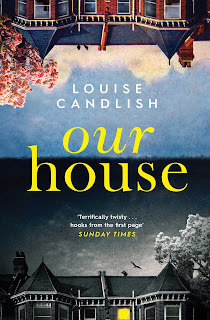 I had seen so many reviews, comments and beautiful displays for Our House by Louise Candlish I was very intrigued by the book wondering what everyone loved about it but it isn’t a book I would typically pick up however a very trusting book friend of mine assured me I would love it so I started it straight away. When Fi arrives home she is bewildered and terrified to find someone moving into her family home. There has to be some mistake but she is unable to get hold of husband Bram to get to the bottom of this horrendous mistake. Bram has made a catastrophic mistake that he can’t find his way out of and now he is set to hurt those around him. Having finished reading this book I can certainly see why there is so much talk about it. This is the first book that has had an ending that has had such an impact that I was actually shouting NOOOOOoOoO at the book and flapping my page around! The storyline was so addictive thanks to the authors tightly woven plot which pulled me in and kept me gripped by the continual events that found Bram digging himself a bigger hole that looked like he would never be able to dig himself back out of. I have picked up two books by this author previously and have struggled to settle into them so never finished them but there was no way I was going to put this book down it was too intense. The pace does slow a little in the middle of the book but I feel that this served a great purpose in making my attention waver slightly resulting in the last part of the book having such an impact. I loved the subtle twists which I didn’t see coming although there were other that I could see from early on in the book particularly one involving a love interest but I have read a lot of crime thrillers recently so I seem to be looking deeply into clues and possibilities more than I usually would so other readers may find more twists reveal themselves along the way. This is certainly one of the best crime thrillers I have read this year and the most frustrating and impactful ending I can remember reading in a long time.